Because I speak to young people in camps and Christian schools often, I love telling stories from the Bible about what a sold out young person or teen can do for the Lord. 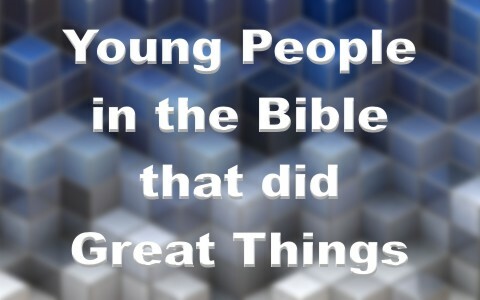 Here are 5 stories of young people in the Bible who did great things for the Lord and are a wonderful example to us today. Regardless of your age you are able to place your life in the hands of God and allow Him to work. Maybe one of the best known stories in the Bible is the story of David and Goliath. When this story took place in 1 Samuel 17 David was probably only 17 years old. In this chapter we see David as an obedient son (1 Samuel 17:17-20), a brave soldier (verses 26 and 32), and, above all, a young man who fully trusted God (verses 37, 45-47). David was told by his father to take provisions to his brothers who were fighting in the Israelite army against the Philistines. When David arrived he heard the champion of the Philistines, the giant Goliath, blaspheming the name of the God of Israel. David could not stand that someone would speak evil of the Lord. He was surprised that the army of Israel was not doing something about the wicked threats against God. David presented himself before King Saul as someone who would go to fight Goliath one on one. David could not use the king’s armor that was offered to him because it was something he was not accustomed to using. Since David had battled lions and bears using his bare hands and a sling, he figured he would do the same with Goliath. David chose 5 smooth stones from the riverbed and rushed to fight Goliath. With a single stone he was able to knock the giant to the ground. Then David took Goliath’s own sword and killed him by cutting off his head. David was a young man who trusted God to do great things. Therefore, David is known as a young man who did great things for God. Joseph had been sold by his brothers into slavery in Genesis 37. By the end of the chapter Joseph was serving in the house of Potiphar, a government official and military commander (Genesis 37:36). Joseph served in the house of Potiphar and apparently had been greatly trusted by his master. Joseph said that he had been given stewardship over everything in the house except Potiphar’s wife (Genesis 39:9). When Potiphar’s wife flirted with Joseph, he wisely rebuffed her advances. Though he did what was right and wise, he was falsely accused of acting inappropriately with her. The result was that he was thrown in prison (Genesis 39:11-20). The story of Joseph is a good example that just because we do what is right, it does not mean that immediately we will be praised for it. However, in the end he was honored by God and justified in the sight of men for taking a stand to do right even when it was not easy nor pleasurable. There is a wonderful story in 2 Kings 5 about Naaman being healed of leprosy by God. One of the minor characters in the story is a little slave girl of whom we know almost nothing. However, the one thing we know about her is that she was concerned for the people around her that they would know the power of God. I have often thought of her as an Old Testament missionary. She was in a land that was not her home. She was actually there against her will. Yet, she still loved the people God had placed around her and was willing to share what she knew about the Lord with them. When she learned that her master Naaman had leprosy, she willingly told him about God’s prophet Elisha and how that God worked through this man. Naaman went to Elisha because he trusted what this little maid said. Naaman, the captain of the army of Syria, trusted the words of this young lady. Naaman went to see Elisha and was healed of his leprosy. We know nothing else about this young lady, but we know enough to surmise that she loved the Lord and the people God called her to serve. She was also a trustworthy and honest servant. Another beloved story in the Bible is in the book of Daniel. Many people would know the story of Shadrach, Meshach and Abed-nego when they were put in the fiery furnace. Even more would remember the story of Daniel in the lion’s den. Did you know Daniel was somewhere around 80 years old when that took place? We don’t know precisely when Nebuchadnezzar build the statue that he wanted the people to worship. But, it was sometime between the 3rd and 23rd year of the Babylonian captivity. It is believed that Shadrach, Meshach and Abed-nego were cast into the fiery furnace when they were between 10 and 30 years old. They certainly were many years younger than Daniel was when he faced the lions. However, there is another interesting story about these four young men in Daniel chapter 1. They may have only been about 8 years old when they stood up for what they believed. They were offered food and drink that were against their traditional Jewish beliefs. They had already gained favor with their captors and requested that their diet be changed to something more familiar. They stood up for their beliefs even as very young men. The result of their decision to honor the Lord with their eating habits was that God gave them knowledge and skill in learning and wisdom (Daniel 1:17). This verse also says that Daniel was given an ability to understand dreams and visions which is basically what the rest of the book is about. In the New Testament there is a story of a young boy who responded to a call to do something for the Savior. Christ was surrounded by a multitude of 5000 men (with no mention of how many women and children there might have been) in John 6. Jesus looked to His disciples for a solution to the problem that the multitude was hungry and that it was late in the day. Of course, Christ already knew what He was planning to do (John 6:6). Jesus asked Philip where they would get enough bread to feed the crowd. Philip didn’t know, but doubted that it could be done with the limited resourced they had. Andrew sought for a solution. He found a young man with a meal of 5 loaves of barley bread and two small fish. The boy could have refused to give up his lunch. He could have chosen to run away when the disciple approached him and asked if he would sacrifice his meal for Jesus. Neither Andrew nor the boy knew what Christ would do, but this boy allowed the Lord to use his little gift. He trusted Christ with his possessions even though he did not know what the outcome would be. Jesus took the food and gave thanks to God for it. He distributed the food to the disciples who took each piece they were given and started handing it out to the people around them. Surprisingly there was plenty of food to go around. When everyone had finished eating, the disciples gathered up the food fragments and brought them back to Jesus. In the end they gathered 12 baskets full of food. Like this little boy, we should be willing to hand over to the Lord anything that He requests from us. We may not know what He will do with it, but if we trust Him with our possessions and our lives, then He will do something wonderful like He did with this little lunch. Regardless of your age you are able to place your life in the hands of God and allow Him to work. God is doing, and will do, a great work in this world. He chooses to use people of all ages to accomplish His purposes. How wonderful it would be to allow Him to use us to accomplish great things for Him. Thanks for this, very nicely put and inspirational. I might talk about the boy with the loaves for my children’s story this Sabbath. Thanks for this powerful enlightenment. Truly Lord Jesus is our only Living and sovereign God. His plans and purposes to each everyone of us will be accomplished. His will be reign forever and ever. Amen. A very insightful article! It will be very useful in preparing a sermon which addresses, in part, how God can use young people in Missions. Thanks so much, Brother David. To God be the glory. Bro. David, thanks for this teaching as it helps us (other pastors) to get some ideas about this topic. Hope, it’s ok from you to use this for my preaching. God is doing great work in you and through you to the world. Thanks a heap David. I hope that it is in order to use your insights to reflect as examples in my assignment. Hi bro David.. thank you so much for this. You helped me a lot in making my message for the kids.. Glory to God! I hope its ok to you if I use your work as additional reference for my sermon. God bless you and your family! What a joy my friend to hear this. I will pray God’s Spirit has His way with you.